What I'd do for the clocks hanging from the ceiling! The architecture of this place is still one of the best of all time. The incoming natural light sets it apart from many other malls of the era. I would die for those clocks. I would also kill for those high ceilings. You ran a picture of the nearly identical center court at Southcenter last year. Comparing that photo with this one, you'll see that the Bernie's signage is slightly different. If you look at the Penney's at the end of the concourse in this photo, you'll see a huge grate just to the left of the Penney's sign. That grate is still there today and is probably the best positive ID that this is from Tacoma. I've puzzled a lot over these three photos to try and figure this out... it feels like one of those puzzles in the newspaper where there are two cartoon drawings and you have to find the tiny details that are different! Definately Tacoma mall. Southcenter had a large chandelier with lots of flashy spangles hanging around it, up in that atrium. I only found Tacoma Mall in the 90s, and nothing was in their atrium, but Southcenter had these same clocks mounted in a few places on walls. They have a hexagonal face, the same matte "champagne" color of many 60s ladies' watch faces, with narrow "wings" filled with clear low-voltage lights to either side of the face. I wish I had one. So many things both had that are gone: the sculptural fountains, the clocks and light fixtures, the planters. 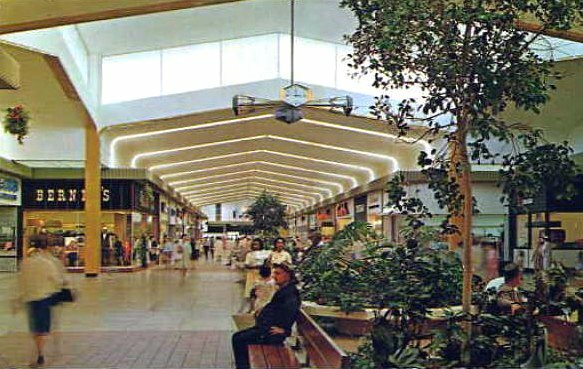 I do love the 70s look of, say, Taubman malls, but to me Southcenter and Tacoma will always be the perfect malls. Clean, bright 60s architecture, the likttle "secret" dark brick corners and wall sections in odd spots, the gothic-arch ceilings, the plants, the quiet hushing sound of distant fountains. Just magical. There is virtually no difference between this and the Southcenter mall. In fact, other than the stores, this picture looks like it could have been taken yesterday... Southcenter is currently undergoing a major expansion, but this part of the mall should be pretty much untouched. Almost... The planters are gone. See that circular section? Now there's a kiosk selling blinky doodads for moble phones right there. The hallway straight ahead looks different at Southcenter, too - Southcenter's layout was slightly different than Tacoma, in minor ways. Both had these planters though and, as noted, both had the funky clocks, though displayed differently. In the past month or so, they've actually moved that kiosk and set up a "living room" of chairs and small sofas and tables arranged in the big circle. Along the main concourse, large panels of skylights have been cut into one half of the ceiling, spanning the width between two of the old skylights and then skipping a section. It has a very incongruous look and when the sun is directly overhead, the concourses can get unpleasantly bright. They've really been in high swing with the construction lately... take a last glimpse of what's left of the old look while you can. 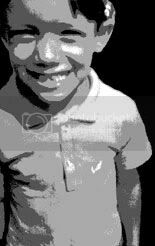 Yet another great Blog Site of yours, thank you! I worked at the JC Penneys on Fort St. in Lincoln Park, 1 year later moved back out west, ended up in Seattle in '73 where my daughters were raised. I ended up working at the JC Penneys at Southcenter, when they opened the first ever catalog dept. on the west coast. I was the only outside hire because of my work experience in Lincol Park. Too cool! Anyways, you have some great photos of the mall, thanks for posting them.